Pit Ed --> Switches to SUNDAYS. Pit Ed Junkies - It's time to switch back to SUNDAYS! Starting this weekend, all Pit Ed classes will swing from Saturdays to Sundays. Beginning Class is still at 10-11am, and Drop-In starts at 11:30am. See you on August 28! Photo: Charity Jara is helping Star perfect her down-stay in class. 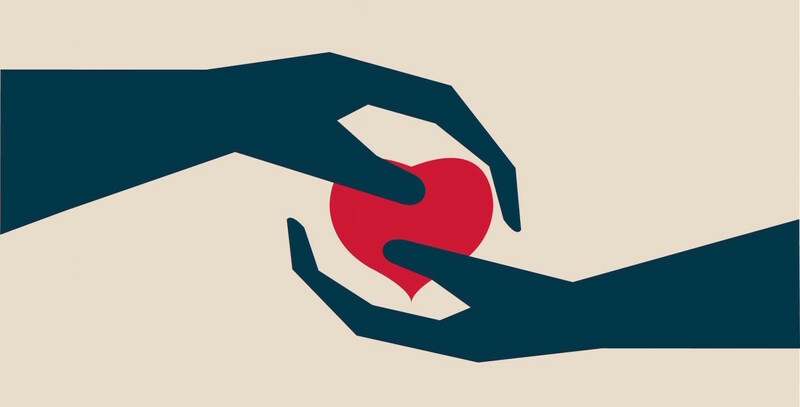 This past week of difficult headlines has made us even more appreciative of generous donors who value the work of education and advocacy, and whose recent gifts allow us to continue this mission - most notably, barn raiser extraordinaire Aron Woolman and Pat Oddone (who sent a gift on behalf of Erich Borat). Thank you. 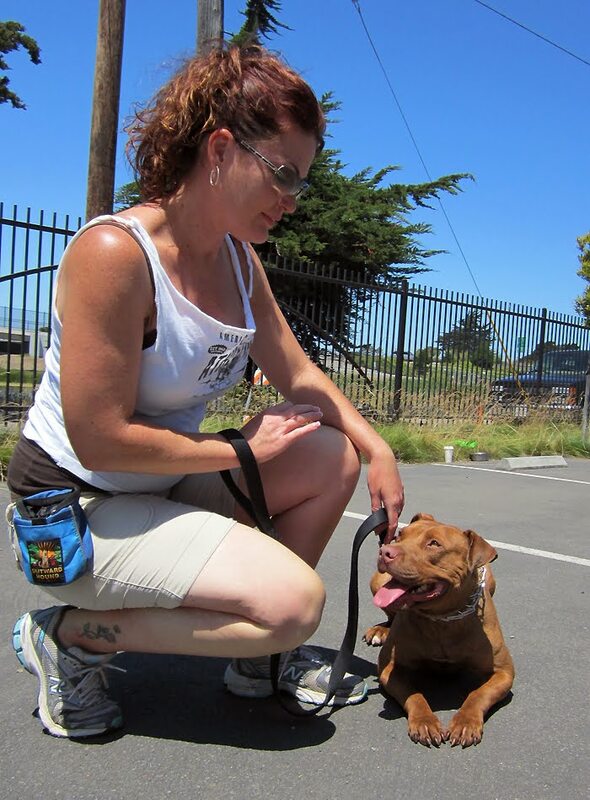 We're also grateful to PetSmart Charities, who has been helping shelter pros from around the country get to several on-site training opportunities including home-sweet-home Oakland for hands-on work with the dogs we all love. This work is in partnership with Best Friends Animal Society. Don't you love how many good guys are out there? Last weekend, we were fortunate to host representatives from Davis County Animal Control Utah, Iowa City Animal Control and Adoption Center and the Humane Society for Tacoma & Pierce County (WA) for four days of workshops, presentations, training, gab and fun. We call it 'Pit Ed Camp' and the only thing we were missing was the s'mores (on the shopping list for October's camp). Camp is set up to give attendees a glimpse into BR's key activities including housing and socializing the dogs in our barn, working them in Pit Ed Class, evaluations in a shelter setting and finally, putting together a shots fair. They also tour Berkeley Animal Care Services, and learn how the community of Berkeley has been working so hard to help the dogs. (Report from Maddies Fund on Helping Berkeley's pit bulls). Above: Tracy Roddam from Davis County Animal Control Utah takes low rider Nita through class. (Pssst...She was a pro). Below: Catherine Godlewski demonstrates the fun of canine nose-work to provide enrichment and confidence building to bored shelter dogs. 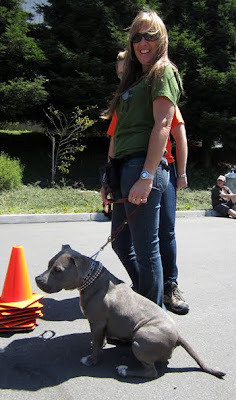 The favorite hands-on 'workshop' seemed to be our outreach event in East Oakland, where campers helped us distribute necessary resources to low income pit bull owners: vaccinations, microchips, leashes/collars, training help and spay/neuter surgeries. Everyone worked their butts off at this event, setting up crates, registering clients, helping dog owners with important information. 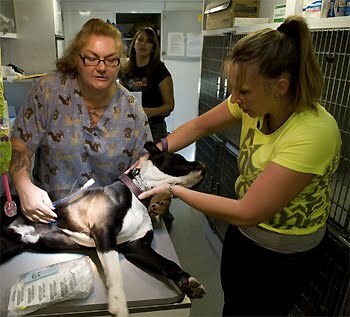 I don't know if Brigitte Draper knew what was in store; once we found out she was an RVT in Utah, we dragged her into the spay/neuter van to help with surgeries. Her help made all the difference. Shown on the right here, with Beth Garland on the left. 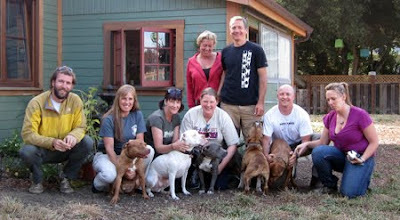 Thank you, ladies - and thank you Sonoma County Animal Services for loaning the van. PHOTOS! We're getting ready to host two more camps in 2011, and yet more in 2012. These are probably the single biggest activities that give us Badrappers real hope for communities in other parts of the country. Thanks to so many smart, compassionate doers in the sheltering world, pit bull type dogs are finding their seat on the bus - and there's no turning back. My dog offered a sobering lesson the other day, which I'll get to in a minute. 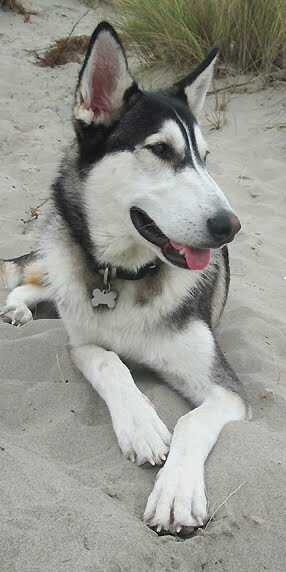 He's a large, 85 pound husky-mix and not quite two years old. I've had him since he was a pup. He's my right hand man; my shadow. Well trained, gentle, beautifully socialized and responsive. When we get playing, of course it's fun to tickle and tease, wrestle and chase. Sometimes we get sliding across the hardwoods, me laughing and him panting and wagging with the goober-eyed look most dog owners know well. But on this day, I was getting him a little too riled and I pushed too hard and it scared him. He tensed up a bit and mouthed my arm harder than he normally would. His message was clear: "Please stop." Reality check: My dog is an animal, not a little person. I mean, I know he's not a little person, but his teeth in that moment offered the full reality that - Oh yeah - I'm getting an 85 pound dog super amped and the only way he can tell me to stop would be to correct me, much like a dog would correct another dog who was being overbearing. "Stop!" Elliot showed considerable restraint by pulling short of a stronger correction, but what I really wanted to thank him for was revealing the blessed beast that lives inside every house pet dog. I wasn't with my house pet in that nano-second; I was with the primordial wolf who knows his strength and his boundaries. Elliot is most decidedly an animal before he's a dog, and he's a dog before he's a house pet. Yep - Got it. I've fallen back on that lesson several times this past week as the media prodded at the dog related fatality in Pacifica. He's an animal before he's a dog, and a dog before he's a pet. Darla Napora of Pacifica loved her dog completely, but something terrible happened in her home and now she's one of 30 or so people a year who are killed by dogs in this country. This particular case is making investigators and onlookers absolutely crazy because no one can figure out what really happened. 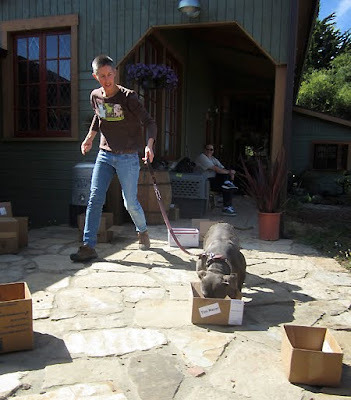 Yes, the dog (Gunner) was a large unneutered male, but that alone does not give us the answer. In nearly all of dog related fatalities, we get a roadmap of several messed up circumstances that typically lead straight back to the whys of each tragedy. (KC Dog Blog's Road Map) Not in the Pacifica case however. Final forensics reports may or may not reveal the key to the incident ...Was there a physical abnormality such as a brain tumor in the dog? A pregnancy related fainting spell? (Darla was pregnant) ... but at the end of the day we have to accept that we may never know what triggered the incident. Even as we share the grief of Ms. Napora's family, we do well to keep two things in mind. First, serious incidents involving dogs have always been exceedingly rare, though they generate news coverage that creates an impression they are more prevalent than they actually are. There are roughly 78 million dogs in the U.S., and 308 million human beings. Annually, there is one dog bite-related fatality for every 10 million human beings, and every 2.5 million dogs. Second, official reports may shed some light on the unique calculus of an incident; but they are never a basis for generalizations about all dogs, or even one kind of dog. To illustrate, consider the following. The week before Ms. Napora died, a pregnant woman in Milwaukee, Sharon Staples, was shot to death in the street, in the presence of her 13 year-old son. Police arrested three teenaged boys in connection with her death. There are over 20 million teenagers in the United States. What will the investigation into the death of Sharon Staples tell us about teenagers? Reports concerning the death of Darla Napora cannot be used to generalize about any of the other 78 million dogs. Greg Napora and his family have asked that people please avoid implicating a breed type in this incident. After all, Tazi is a pit bull. He told me by phone: "I really wish I knew what happened, but at the end of the day, Gunner was an animal." There it is again. The fact that he still loves his dogs is probably the greatest but hardest to understand lesson of all. Rest in peace, Darla and Gunner. 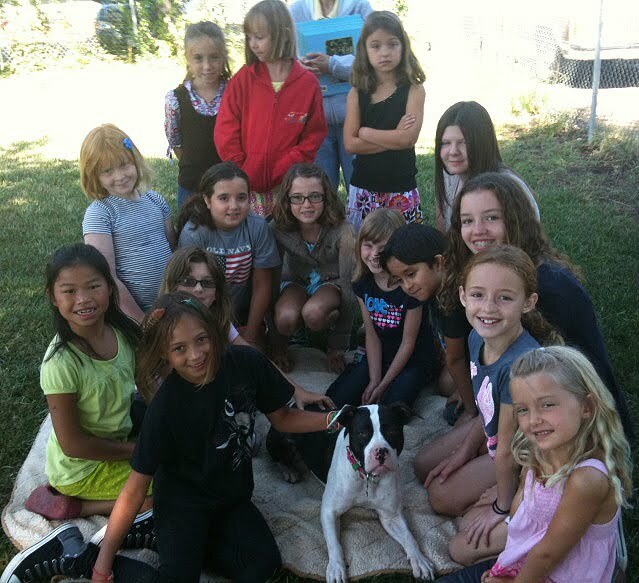 A summer kids camp at Pet's Lifeline in Sonoma County recently introduced a group of kids to pit bulls via the story 'Saving Audie.' 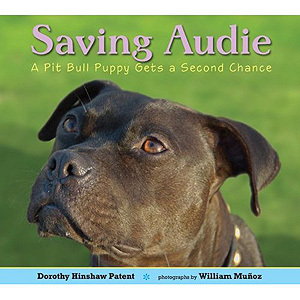 Audie as you probably know, was rescued from Bad Newz Kennels and the story covers his rescue and recovery in kid-friendly photos and text. Bang. Loud rambicios roudy yells of the tall gangely men and and some stalky staring down at me there faces hard looking me agressively in the eye I backed against the side of the pen and a surging sting quivering through my body as I was shunted forward a single word forming on my owners lips on who broke me one who beat me all feeling pulsing in my head the wall of sound behind me "fight". he mouthed the dog opposite me head lolling in confusion but behined the bared teeth I saw a spark only for a split second it read a single word love. 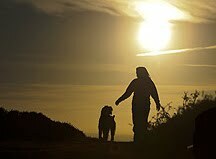 and behined the bared teeth I looked into the dogs sole it was there a kind loving other being. A dark shadow crossed his face a hurt tortured look. And the fight began. I closed my eyes. I woke up some time later how much time had passed I didn't know it could be weeks or months or years. But the pain was behined me of the fight. But it was still with me it had formed me in the deepest part of my broken heart. A worker dressed in a uniform passed by shooting me a sorrow filled glance and I flashed back in my mind to that terrible place. Pressing myself against the cinder block wall crumpling in a corner. I wanted to float away like a balloon drifting further and further awy from this place of misery and hurt. Then suddenly a heavy metal door opened and soft warm loving eyes met mine she didn't look at me like I was a monster or a terror and she opened her hands in a frindly gesture and suddenly the cinder block wall felt cold so on shaking quivering legs I got up and walked toward a new life." That's a whole lotta deep thinking for a 12 year old. It's certainly going to be interesting to see what the new generation brings to animal welfare as they come into adulthood with books like Saving Audie as their guideposts.